Giant ears that can locate a midnight meal of crunchy insects. Wrinkled faces that channel flowing fruit juices into a thirsty mouth. Long tongues that collect energizing nectar from deep within a flower. 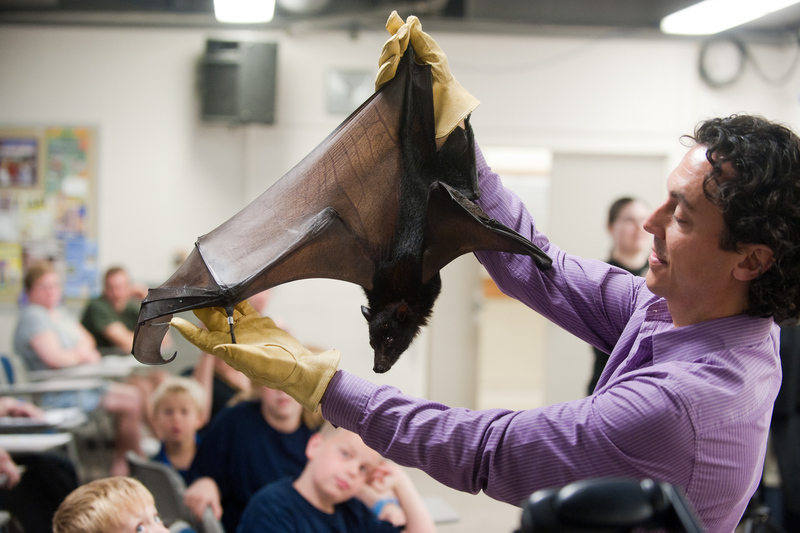 Photo: https://photos.smugmug.com/Events/Events-by-Year/2011images/Bat-Festival-2011/i-FWTkQhK/0/X3/08_27_11_bat_festival-7477-X3.jpg - Rob Mies, executive director of the Organization for Bat Conservation, holds a Malaysian Flying Fox fruit bat at the 2011 Indiana Bat Festival. Rob Mies and his bats will return to delight visitors at this year’s festival. Contact: Joy O’Keefe, assistant professor, department of biology, Indiana State University, joy.okeefe@indstate.edu or 812-237-4520. Writer: Elise Lima, communications specialist, Office of Communications and Marketing, Indiana State University, elise.lima@indstate.edu or 812-237-3743.